Life Before the Dinosaurs: Research trip. Wanna help? He's going to love the Field Museum, particularly Evolving Planet. They have one of the most fantastic Cambrian and Paleozoic sections I've seen of any museum. The virtual sea display is truly mesmerizing. Good luck fundraising! I went to the Field Museum for the first time this summer--I wish I would have started going at 8...I'm 37. :) I loved it so much, and you will, too. I will contribute to the cause soon. I'm learning so much from this blog. I used to be closed off to science, because I wasn't prepared for what the answers that it provides might mean. Now, I embrace it, and this resource is a treasure and an inspiration. Thanks to you, Art, and thanks to The Mom! How much for the naming rights? You wanna name the entire adventure? ... just how attached are y'all to "Art"? Oh, I see. You wanna pony up the cash to rename the child, like, "Chico's Bail Bonds" or something like that? Sure, why not. The Mom: The evolving planet exhibit will definitely be worth the trip! But I think you should email the link for Art's blog to the head curator and see if you can get a behind-the-scenes tour. Most of what a museum has in its collection is not on display at any given time, and the rows upon rows of specimens (fossils and things in jars!) are mind-blowing. Definitely my favorite part of the museum, which I got to see as an undergrad. As long as you're in Chicago, don't forget the Shedd Aquarium, as well. Lots of displays of fish and invertebrates. 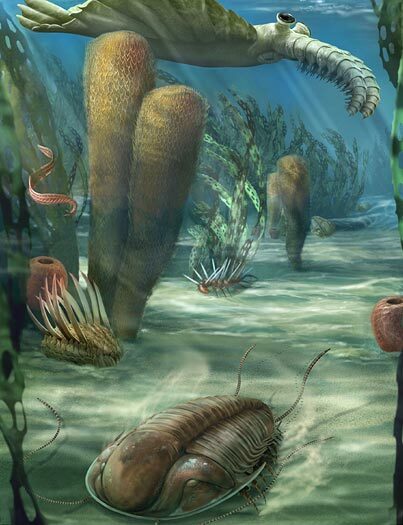 It would be a great learning experience to take a look at all the extant species and how they remained similar or have changed from the ones that lived in the Paleozoic. And if I remember right you get to pet starfish and sea urchins! We're hoping to go behind the scenes a bit, but we're not sure we can secure that kind of red carpet treatment. Art was somewhat disappointed at the Smithsonian Museum of Natural History earlier this year when he found that many of the specimens he was dying to see (Pikaia in particular, as I recall) had been removed from the exhibits. So thanks for the advice. It would be a bummer if we travelled all the way to Chicago and half the Evolving Planet exhibit was closed down or empty. Which would be just my luck. Art's love of marine invertebrates began when he was a preschooler, and we visited Shedd Aquarium when he was (I think) four. It's an amazing place. He was particularly interested in the moon jellies and that sort of thing. He loves an aquatic blob. There is a special jellies exhibit at the Shedd right now - very cool. Am I the only one noticing the sasquatch walking around on the sea floor there? Last year we travelled from our home in England for a holiday in Kentucky, where we had lived many years ago. Passing through the airport in Chicago I was bowled over by the dinosaurs on the concourses and wished that we had time to visit the Field Museum. Maybe another time. I'm so glad I stumbled on this blog. I'm happy to pitch in on what I hope proves to be a great trip. The CG animation of the Burgess fauna is really fantastic as you enter Evolving Planet. If you ever get out to the new Museum of Natural History of Utah, let us know since we do fossil prep in the lab.